5-HTP is a precursor to serotonin, a neurotransmitter involved in sending messages through the nervous system. ** Adults can take one capsule twice daily as needed or before bedtime. 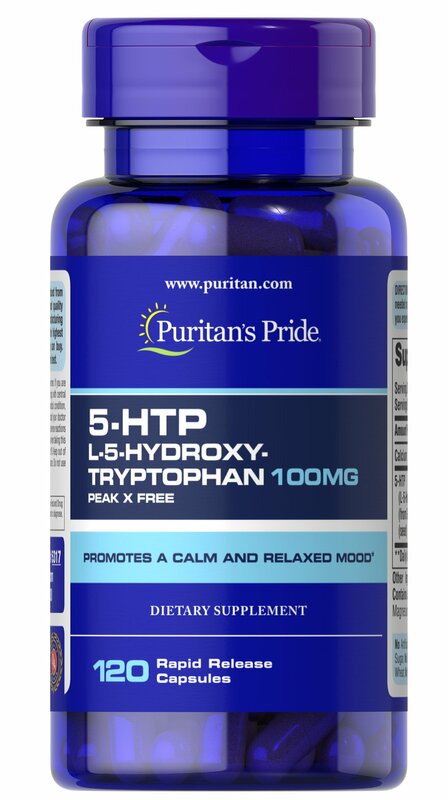 Puritan’s Pride® 5-HTP 100 mg promotes a calm and relaxed mood*. Puritan’s Pride® 5-HTP 100 mg (Griffonia Simplicifolia), contains 60 rapid release capsules. The serving size is 2 capsules, which contains: 126 mg of Calcium, 200 mg of 5-HTP (L-5-Hydroxytryptophan) (from Griffonia Extract) (Griffonia simplicifolia) (seed). No Artificial Color, Flavor or Sweetener, No Preservatives, No Sugar, No Milk, No Lactose, No Soy, No Gluten, No Wheat, No Yeast, No Fish, Sodium Free.